The cleantech industry enjoys a significant presence in the new federal states, enjoying ties to the energy supply/efficiency and recycling/recovery sectors through a large number of networks and initiatives. The most prominent economic players are the solar and wind energy sectors. 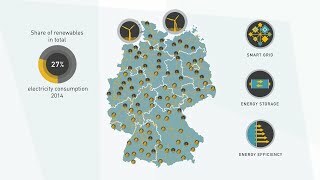 Mecklenburg-Vorpommern counts among the leading wind energy generation regions, thanks to projects like Germany’s first commercial offshore wind park "Baltic 1". Offshore wind manufacturing ports are located in Rostock and Sassnitz. Bioenergy also provides a rich seam of potential as an alternative to fossil fuels. With its considerable land mass, Eastern Germany provides excellent location opportunities. Sustainable water management and recycling are further important lead markets in Eastern Germany – generating turnover of EUR 11.4 billion and employing a 56 thousand plus strong workforce. In a number of new federal state regions, decades of experience in material recycling have helped create specific know-how which is still market leading and internationally unique.